Back in 1974, The Concert Book was a monthly publication put out by Jam Productions that cast a spotlight on major artists coming to the Chicago area, and it covered the local club scene as well. This is Volume One, Number Three, and as far as I can tell, there were no issues published after it. 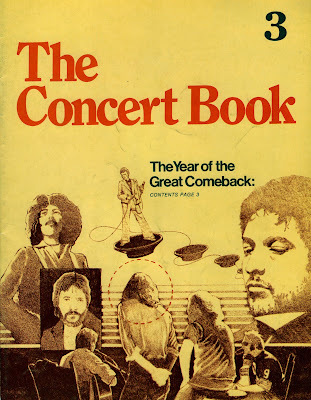 The Year Of The Comeback cover story raises the issue of whether Bob Dylan, who had just released Blood On The Tracks; Crosby, Stills, Nash, & Young; George Harrison; David Bowie; and Eric Clapton still had the chops to put on a good a good rock and roll show. Imagine if someone had told the writers that most of these acts would be actively recording or touring in 2010. There’s also something called a Discopective on Led Zeppelin, and profiles on Jethro Tull and Roxy Music. The back cover is a full page ad for rock station WDHF, and there’s a stark, B&W half page ad inside the magazine touting WXRT’s 6pm to 5am hours. Some of the movie ads include Emmanuelle, The Stepford Wives, Murder On The Orient Express, Stardust, Tommy, Shampoo, and The Godfather Part II. The center spread calendar lists shows by Peter Frampton and Gentle Giant together at the Auditorium; Rod Stewart at the Amphitheatre; Jethro Tull at the Stadium; Robin Trower and Steel-Eye Span in a double at the Auditorium; and Aerosmith at the Aragon. The Different Circle, a chain of jeans stores; Rolling Stone, which used to be one of several record stores downtown (they still have a location on Irving Park); Swollen Head Records & Tapes in La Grange; and Billy K’s Hair Again all had ads in this issue. In those days, as a resident of the southwest side, I would have been most interested in the ad for the Harlow’s rock club. This was a classy place to see the best bands on the club scene, such as the hard-rocking Beowulf The Great; and Brother Bait, an outfit from Atlanta Georgia that played note perfect renditions of songs by Yes, Steely Dan, ELP, and Jethro Tull. The ad noted that its birthday party for namesake Jean Harlow would be a black tie only affair, and they weren’t kidding. My friends and I were also known to cruise the Rush Street area, where we could have checked out some first class live entertainment from Pez Band; City Boys; or Kracker at the “world famous” Rush Up rock club. At only 30 pages, the short-lived The Concert Book was relatively slim, but the writing and cool graphics made it worth picking up.